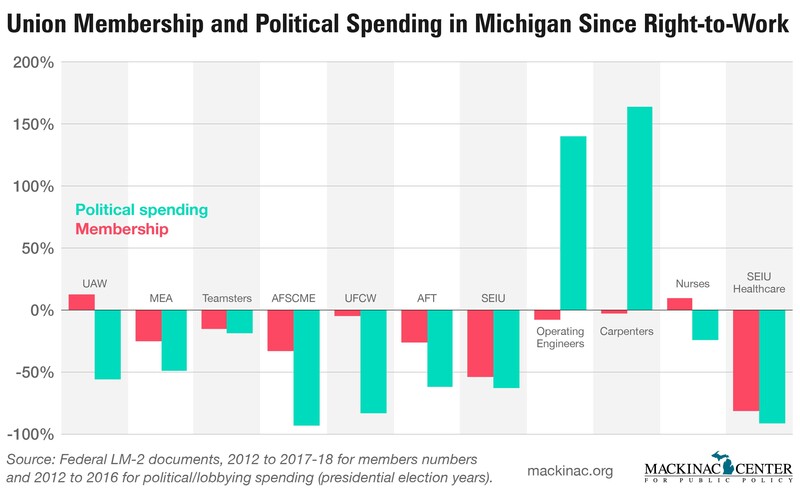 Five years after Michigan – the historic bastion of union power – became a right-to-work state, most of its largest unions have seen a significant decline in membership and political spending. In 2013, Michigan began allowing workers to choose whether to be members and pay dues to unions. Since then, nine of the 11 unions that must file reports with the federal government and have more than 10,000 participants have lost members and cut political spending. As a result, Michigan has dropped from the seventh-most unionized state to the 10th-most. According to federal survey data, the number of people who belong to public employee unions has declined, especially at the state and local level. But the UAW – Michigan’s largest union – has recovered, more than making up for other losses. As a result, private sector union membership has increased by nearly 12 percent since 2012, the year prior to right-to-work. Membership went from 375,163 to 419,603. Total union membership, after bottoming out in 2014, has increased by about 30,000 people in Michigan – from 628,798 in 2012 to 659,285 in 2017. But the UAW is the rare union which hasn’t taken a significant hit. The number of public sector union members has declined from 253,635 in 2012, before right-to-work took effect, to 239,682 in 2017. The number of state and local union members declined by 15 percent, from 231,453 to 197,242. This decline happened despite the state economy rebounding, which has stopped the overall decline in the number of employees across Michigan. The number of government workers in the state, which had been a free fall over the previous decade, has held steady at around 600,000 since Michigan went right-to-work. This signals that the state’s right-to-work law is the primary reason for a loss in union membership and dues. Below is a summary of union membership in Michigan for most of the state’s largest unions from 2012 to the current year. The information is based on a federal report known as the LM-2, which unions have to file if they represent any private sector workers. The American Federation of State, County and Municipal Employees (state and local public workers). Total UAW membership is up significantly, from 382,513 in 2012 to 430,871 today. The rise has coincided with the increase in auto jobs in the state, though membership is well below the recent peak of 701,818 in 2002. Its political spending collapsed from a prior presidential cycle to the latest one – declining from $29.9 million in 2012 to $13.2 million in 2016. UAW Local 6000, a part of the union that represents state employees, does not report membership numbers, but the number of Michigan state employees has held steady around 47,000. About 16 percent of workers have left the union. Other parts of the UAW, which is itself an affiliate of the AFL-CIO, have also lost members. The MEA, the second-largest union in Michigan, has lost 30,000 members – 25 percent – since right-to-work went into effect. Membership peaked in 2005 at 130,882 before dropping to 117,265 in 2012 and all the way down to about 87,000 today. (Note: The MEA counts retirees and students as membership; we only count full, dues-paying, voting members). Political spending from the presidential election years of 2012 to 2016 has plummeted from $4.84 million to $2.47 million. The next largest union in the state is the Teamsters Local 43, a combination of 13 Michigan locals. Membership has declined from 45,625 in 2012 to 38,659 this year – a 15 percent drop. Reported political and lobbying spending from the presidential election years of 2012 to 2016 declined from $150,660 to $122,667. AFSCME Council 25 mostly represents local government workers across the state. Membership has declined from 48,625 in 2012 to 32,595 today – down from a peak of 58,550 in 2001, though right-to-work accelerated the decline. Political spending from the presidential election years of 2012 to 2016 has plummeted from $3.5 million to $240,010. The union had surged in membership after entering a little-known forced unionization arrangement with former Gov. Jennifer Granholm; membership and funds fell significantly after the scheme was disbanded. UFCW 951 is composed of food workers in Michigan. 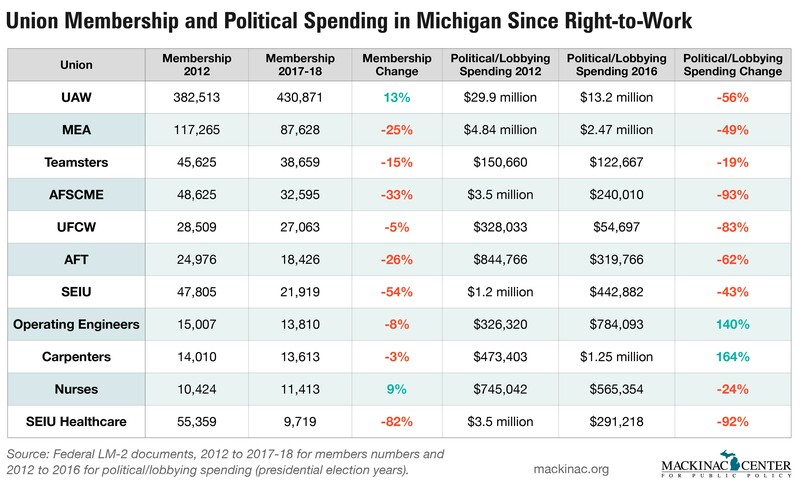 Membership has declined from 28,509 in 2012 to 27,063 today, and political spending from the presidential election years of 2012 to 2016 has plummeted from $328,033 to $54,697. Michigan state government employees are represented primarily by six different unions: the MSEA, MCO, SEIU Local 517, Troopers Association, AFSCME Council 25 and UAW Local 6000. Because they represent only public sector workers, they do not report numbers. But according to state documents compiled by the Lansing State Journal, each has seen an acceleration in the number of opt-outs, ranging from 7 percent to 32 percent. Other smaller unions in Michigan have seen similar declines. The American Federation of Teachers Michigan, which had 24,976 members in 2012, is down to 18,426 today. Its membership peaked at 26,860 in 2005, with a decline accelerating strongly after right-to-work. Political spending from the presidential election years of 2012 to 2016 has plummeted from $844,766 to $319,766. SEIU Michigan is composed mostly of private sector health care workers. The union had 47,805 members in 2012, and it has 21,919 today. It peaked in 2010 at 49,312 members and has been in collapse since. Political spending from the presidential election years of 2012 to 2016 has been more than halved from $1.2 million to $442,882. The association has had constant infighting and allegations of waste in the past few years, with several locals disbanding or switching to other unions. Operating Engineers 324 had 15,007 dues payers in 2012, but it was down to 13,810 in 2017. The union peaked at 16,298 in 2010. Political spending from the presidential election years of 2012 to 2016 more than doubled from $326,320 to $784,093. The Michigan Regional Carpenters had 14,010 members in 2012. It now has 13,613, representing a modest decline, even as the number of construction workers in the state increased by 34,600 jobs (27 percent) since 2012, according to the federal Bureau of Labor Statistics. Its peak membership came in 2001, at about 21,000. Political spending from the presidential election years of 2012 to 2016 increased from $473,403 to $1.25 million. The Michigan Nurses Association had 10,424 members in 2012 and 11,413 in 2017. The association is the rare union that has been on a steady increase – from 7,703 members in 2001 up to a peak of 11,149 in 2013 and then a steady path since then. Political spending from the presidential election years of 2012 to 2016 has declined from $745,042 to $565,354. Employment in health care occupations has been growing. According to the BLS, health care and social assistance jobs in the state are up 38,400 jobs (about 7 percent). SEIU Healthcare Michigan, which was composed almost exclusively of home caregivers, has had the largest total collapse in recent years. Most of that is the result of the Michigan Legislature ending the “dues skim” (automatic unionization), the U.S. Supreme Court ruling that caregivers could not be forced into a union and the state passage of right-to-work. The union has seen an 87 percent decline in membership since 2012, from 55,000 members down to less than 10,000. Political spending and lobbying costs have gone from $3.5 million in the presidential election year of 2012 to $291,218 in 2016. In the next few months, the U.S. Supreme Court will announce a decision in the case of Janus v. AFSCME. This decision could grant right-to-work status to government union members in nearly half the states, including California, New York, Illinois and Washington. While this will not directly affect private sector workers, all public employees could be able to choose whether to pay dues or fees to their union.